Showing results for tags 'Lexaeus'. Okay so I just noticed this the other day while I was playing Kingdom Hearts II Final Mix on the Kingdom Hearts 2.5 HD Remix collection. Each Absent Silhouette is placed in a specific location for a specific reason. Here are the reasons for their locations: -Marluxia Is placed in the beast's room near his flower because Marluxia's element is flowers. -Larxene is placed on Isla de Muerta in the Pirates of the Caribbean world, because similar to a pirate, she is a traitor to Organization 13 -Lexaeus is placed in the Sandlot where the struggle battles are held to determine who is the strongest person in Twilight town similar to how Lexaues is the physically strongest Organization member. -Zexion is placed in the Underworld because he mostly resides in the basement of castle oblivion and uses dark magic and the power of illusions to fight. Now the reason for this thread is I cannot figure out why Vexen is placed in the peddlers shop in Agrabah and I haven't found the answer on google. I was wondering if anyone knew why or would like to discuss why. Also I'd love to discuss the other absent Silhouette locations to see if anyone else noticed this. Long time series fan & like many I found COM to be a frustrating game but I think most people including myself spent more time being frustrated by the game then paying attention to its characters. I was on a different forum posting this theory & even made a youtube video about it but everytime I post it anywhere it gets pulled. Either its that far left field or I am on to something? So here it goes. Castle Oblivion, I am going to break down each major player there & their purpose behind their real plans. Most everyone there is not there for the reasons you think. Vexen is my favorite of the Organization (I do not care for much of them)& thats how I begun to dig into this game. Lets start easy, Sora. Sora is simply lead their by Marluxia falling the events of the very first game & has mostly no major role to play other than being used by every other character for different plans. Riku. Riku ends up here after being lost in the darkness & is looking for the King, Sora, & some way to fight his darkness. Again simple. From here on out things get kinda messy so try to stay with me. Xemnas is frustrated with these 6 members so he sends them off to Castle Oblivion under the notion that this is a mission to dwell in the castle for the time being. Hes frustrated with them because they are either failing him or getting in the way of his true plans. I will explain. Marluxia is a traitor but is not the lead turncoat, but co-leader. We will get back to this. Vexen has been only showing interest in his studies & is no longer a loyal member of the team but instead only wanting to serve his research & doing so even when instructed not to. Vexen at this point has become more in the way because of this. He only remains a member out of fear of leaving. So in the end Vexen is killed because he learns of Marluxias "plan" to use Sora. So Marluxia wanting Vexen to find out nothing more of his real plans has Axel kill him but this not pleasing to Marluxia as he views Vexen as someone who could be won over to his real plan. Thus Vexen meets his end. Lexaeus is another that simply met his end trying to be loyal. I believe he was sent to Castle Oblivion because Xemnas viewed him loyal to Zexion alone. My proof. Lexaeus states that he is aware that he has no idea of any ones real goals but he says Zexion is the only one he can trust. Because Alaeus knew Ienzo as a child so he felt he must protect him & could trust him alone. Lexaeus states this in a report in one of the games, either 358/2 days or com. Lexaeus' death was part of only Xemnas' plan. As Ansem is the one who ended him because they needed Riku alive & knew Lexaeus was loyal to Zexion & if something would happen to him then Lexaeus would be ablaze in anger. And Xemnas needed something to happen to Zexion. So Lexaeus had to go. Zexion, I will come out & say it, I believe Ienzo is Blaine & but lost his memory during time travel much like Terra/Xehanort did when he suffered a large amount of damage at the end of BBS. I believe because of his loss of memory he carried on with life with the other scientists until they all became nobodies & only then did he regain his memory but by that time it was too he had already lost his heart, it was too late he needed a heart. Whats up with the age then? Ven & Blaine are teens in Unchained but are both different ages in BBS because the time travel messed with their ages. Ven appears at the start of the game as a baby when Xehanort found him & Ienzo appears as a child. In com Zexion figures out the plans of all the players. I believe he was sent there there because him & Marluxia figured out Xemnas' plan, Saix & Axels plan, & maybe even Xigbars plan. I believe they both joined the Organization because they both had lost their heart & at first believed that Xemnas really was trying to get all of the hearts back for the XIII but it was not until after they figured out all the players at work here that they chose to turn but was discovered so they were sent to Castle Oblivion on different floors as a way of making sure they could not make much progress in turning on the Organization. Zexion never intened or wanted Lexaeus or Vexen to die but once Vexen found out all that was going on Zxeion seemed to know Vexen would be felled. Lexaeus on the other hand seemed to surprise Zexion that he had passed. Most likely because Lexaeus had won the fight had it not been for Ansem. Zexion & Marluxia were clearly not pleased with the deaths of their team. Marluxia was sent their for the same reasons as Zexion but I believe it is all but confirmed that he is Lauriam in Unchained. Which both him & Blaine are in the same faction which I believe Lauriam & Blaine staged the death of another member to get Lauriam in. Why did he not appear in BBS then? Because he was placed in a different world after the time travel & spent the time during BBS looking for Blaine. And it was not until they both lost their heart that they found each other. So when Zexion & Marluxia were found out they realized they would need a plan which worked out perfectly because they wanted to find Ventus to wake him which is locked in a room somewhere in Castle Oblivion. I believe they leaked that Marluxia was the head of the turncoats because they needed to be sent their to carry out their plan. Which was to lure Sora to the Castle & use Namine to wake Ven who is connected to Soras heart. Its unclear Zexion & Marluxias true motives but clearly they either need Ven so they are free from the Organizations hand or for some other reason but they clearly need Ven. Axel I believe was ordered to kill all of the ones stationed at Castle Oblivion, how he did it I believe he came up with it on the fly. Vexen was clearly a goner once he found out what everyone was up to. 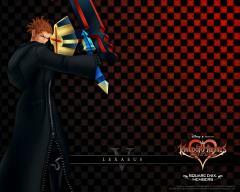 Axel avoided Lexaeus & Zexion until Lexaeus had passed because Axel knew Lexaeus would defeat him & protect Zexion. Axel knew letting Namine go would make Larxene go after her which of course crossed her path with Sora for the last time. And Axel seemed to believe he was going to have to kill Marluxia himself until Sora came in & did the job for him. Axel then waited & used Riku Replica to strangle a weaken Zexion until he faded. 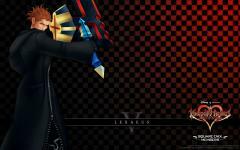 Which leaves Larxene. I believe once Zexion & Marluxia leaked Marluxia turning in order that they were sent to Castle Oblivion they knew they would need a way to leak it so they had Marluxia ask Larxene who feels disrespected by Xemnas & the above members to join which allowed Xigbar to overhear this & inform Xemnas. Which we know Xigbar listens to conversations based on a scene in 2 remix with Zexion which Zexion states that he knows whats in the chamber of repose & Xigbar suggests that Zexion knows of the place where the other friend is, since we know Aquas armor is in the chamber of repose then the other friend must be Ven who we know was locked away at Castle Oblivion. wrapping up the entire theory in neat bow. This seems mostly inferred from closer inspection but I admit I did have to connect a few dots but I feel most of this is likely. Thoughts?